The protection that zoning gives us is under attack not only on the local level! "Congress, which has done so little this session to address the nation's real problems, is expected to vote today on a deeply misguided giveaway for big real estate developers. The bill would create new property rights that could in many cases make it difficult, if not impossible, for local governments to stop property owners from using their land in socially destructive ways. It should be defeated. The Private Property Rights Implementation Act would make it easier for developers challenging zoning decisions to bypass state courts and go to federal court, even if there was not a legitimate federal constitutional question. 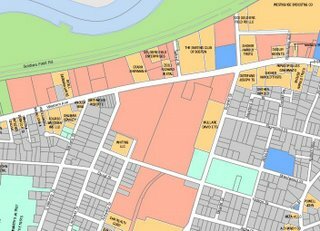 Zoning regulations are quintessentially local decisions. This bill would cast this tradition aside, and involve the federal government in issues like building density and lot sizes. The bill would also make it easier for developers to sue when zoning decisions diminished the value of their property. Most zoning does that. Developers would make more money if they could cram more houses on small lots, build skyscrapers 200 stories tall, or develop on endangered wetlands. The bill would help developers claim monetary compensation for run-of-the-mill zoning decisions on matters like these. It would also make it easier for them to intimidate local zoning authorities by threatening to run to federal court. Zoning is not an attack on property rights. It is an important government function, and most Americans appreciate that it helps keep their own neighborhoods from becoming more crowded, polluted and dangerous. If more people knew the details of this bill, there would be wide opposition. As it is, attorneys general from more than 30 states, of both parties, have joined the U.S. Conference of Mayors, the National Conference "
TownOnline.com - Local News: St. E's wants to axe trees: "Neighbors are outraged over a Brighton hospital's plans to axe trees and green space in this densely populated neighborhood. At public meeting two weeks ago, St. Elizabeth's Medical Center mapped out a plan to expand Monastery Road as an access road to the hospital. Plans for the hospital's new emergency room are currently in the works. At a meeting this week hospital officials announced that they not only want to expand Monastery Road, but they also want to build a new road off of Monastery Road. The new road would provide temporary access to the hospital's old emergency department while the new department is under construction. The new road would eventually become a second, permanent entrance to the hospital, hospital officials said"
If the BRA holds a community meeting and no one shows up do neighbors still have concerns about the project? Last Thursday, as part of the community review process, the Boston Redevelopment Authority held a public meeting to discuss a plan to erect a 15-unit building at 9 Gardner St. The only person to attend who was not part of the development team or a city employee was Paul Berkeley, head of the Allston Civic Association. The project is seeking variances for parking, use, rear yard space, floor area ratio and open space. City Councilor Jerry McDermott became a media celebrity last week when he proposed removing the famous Citgo sign in Kenmore Square. But the Allston-Brighton politician insists that the move wasn’t meant as a publicity stunt or designed to advance his political career. "When I filed the order, I didn’t think about the reaction," said McDermott. "I’m not desperate for publicity." Since McDermott announced his City Council resolution to remove the landmark sign last week, he has appeared on CNN, FOX News, MSNBC and other national and local media outlets explaining his beef with Venezuelan President Hugo Chavez and Citgo, a Venezuelan oil company. He was also quoted in the New York Post, Chicago Tribune and papers from Venezuela to Asia. Several months ago, McDermott told former Allston-Brighton TAB reporters and editors he hoped to run for state auditor in a few years. McDermott has said he wouldn’t consider running for the office unless current Auditor Joe DeNucci retires. Although McDermott would not rule out a future run for a higher office, he said he’s committed to Allston-Brighton and plans to stay in his office for the time being. None of McDermott’s colleagues on the City Council supported his proposal, and the resolution was referred to the City Council’s committee on public utilities and cable communications. Even if the resolution passed, City Council does not control the sign. The Citgo sign is on a building at 660 Beacon St., which is owned by Boston University. McDermott said he would like to find out if the university might be willing to not renew the lease. He also wants to invite NSTAR and the Landmarks Commission to a hearing to find out who is paying the electric bill for the sign and whether or not it’s an official landmark. You can also call 617-918-4317, fax your comments to 617-742-7783, or e-mail them to jay.rourke.bra@cityofboston.gov. A public meeting will be held on Thursday, Oct. 12, at 6 p.m. in the auditorium of St. Elizabeth's Medical Center. 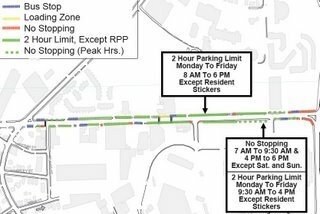 3) Non-residents parking in these areas may end up parking on the residential side streets instead. BTD promised that they will continue to focus on the situation after these regulations go into effect so that additional changes can be made if needed. You can contact Adam Shulman at BTD (617 635 4680) with your thoughts on this plan. BTD will be at the October 11 task force meeting (6:30 at the Honan Library) to update the plan and schedule for implementation. 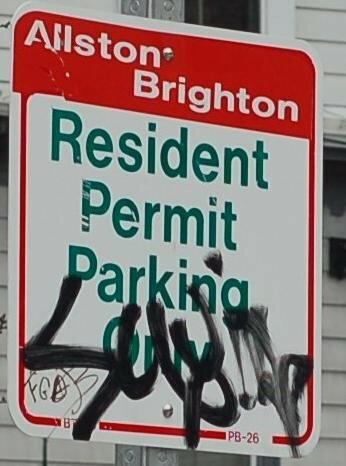 More of us now will have a reason to get a resident parking sticker. Infomation on how to do that is here. A main topic of this week's Harvard Allston Task Force was the unused buildings that Harvard owns in Allston. Harvard will now give 5+ year leases on many of these properties. They also expressed willingness to consider below-market rents for artists, non-profit organizations, or others that might merit such favorable treatment. The presentation Harvard gave is available here. Many of the areas shown in red in this map have available space. Click the map for a full-resoltion PDF. Hopefully they will do more to advertise this opportunity such as advertisements in the Allston-Brighton TAB and posting "For Lease" signs at the applicable buildings. Colleges pledge $10m boost to 10 Boston schools - The Boston Globe: Five Boston-area universities said they will pump $10 million in funds and services into 10 of the city's underperforming public schools to improve test scores and increase the number of students going to college. Boston College, Boston University, Harvard University, Northeastern University, and Tufts University will provide expertise and services to the schools, which are yet to be selected. The universities pledged to provide $5 million in funds and another $5 million in direct services. The colleges plan to meet to determine which schools would benefit the most. TownOnline.com - Arts & Lifestyle: Stroke! Stroke! Stroke! It's Head of the Charles: "More than 7,500 men and women will travel from around the globe to test their rowing abilities when the world's largest regatta returns to the banks of the Charles River for the 42nd annual edition of the Head of the Charles Regatta, starting at Boston University's DeWolf Boathouse in Cambridge and ending at Artesani Park in Allston"
Come join us [outside!] for some great food [vegetarian], music, raffle, and an exciting presentation on how urban transportation effects our everyday lives. Mingle with us and others like you who are committed to improving urban transportation. Friday we will be showing a 10-minute clip about how Portland faught the major highway that would have run through their city in the 70's, and the positive consequences that resulted from this decision. View our summer series of 10-minute "Word on the Streets" videos about Boston, produced by our summer intern Elisa. A Globe profile of the owner of SoulFire, a new BBQ restaurant on Harvard Ave.
BostonHerald.com - Opinion & Editorial: Sign proposal's a real gas: "Oh, sure, Jerry McDermott's heart is in the right place. 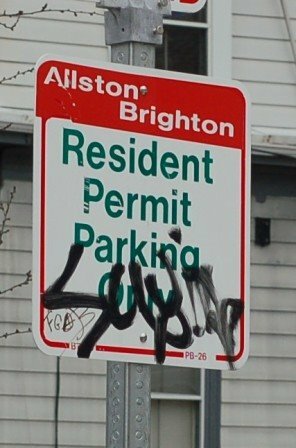 But on the silliness scale, surely the Boston city councilor's call to tear down the iconic Citgo sign in Kenmore Square has to rank near the very top"
Remind your fellow Allston and Brighton residents that part of what makes this a great country is the right to express your opinion without the fear of government censorship. When you wear clothes from The CITGOGEAR Collection you are making a statement that our Founding Fathers were right when they said "Congress shall make no law abridging the freedom of speech". Local News Updates - Boston selects new schools superintendent -The Boston Globe: "After a nine-month search that appeared to disintegrate in June, Boston has selected the man it wants as its new schools superintendent. Manuel J. Rivera, superintendent of Rochester, N.Y., schools, will retire at the end of the school year and take over the Boston post, becoming the city's first Hispanic superintendent." Keep the CITGO Sign? Your vote counts! OK, so Allston and Brighton didn't turn out in great numbers to vote for Governor on Tuesday. But thanks to WCVB-TV 5, we have a second chance! 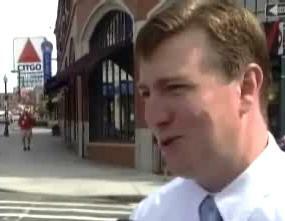 Councilor McDermott says Boston should remove the CITGO sign and you can cast your vote here! Almost 700 people have already voted and 35% agree with Jerry that the sign should go. 62% say no. Is a simple Yes/No vote not enough for you? Then join the conversation on the NewsCenter5 website! McDermott - "Chavez overstepped it"
"I’m a Boston guy – born in 1967, the year the Sox won the Pennant," McDermott told WBZ Radio. "And it used to mean something different to me. 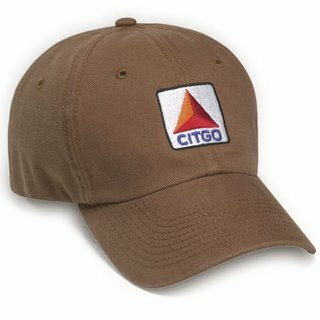 But, symbols are powerful things, and right now when I see that CITGO symbol, the only thing it symbolizes for me, is a dictator that means to hurt our economy and hurt our way of life." The Harvard Crimson :: News :: Lose the Booze at Tailgate, Says Dean: "The November 18 Harvard-Yale Tailgate-historically a boozefest-this year might look more like a Boston Tea Party. Students will not be allowed to bring alcohol into the tailgate, according to rules released yesterday by Dean of the College Benedict H. Gross '71 after negotiations with the Boston Police Department (BPD). After a tailgate so rowdy in 2004 that BPD Captain William Evans said, 'I was embarrassed to be a policeman on that field seeing what I had to see,' top College officials are cracking down on alcohol use-and student leaders are not happy." Allston-Brighton City Councilor Jerry P. McDermott wants the Hub to fire back at Venezuelan President Hugo Chavez for calling President Bush "the devil" at the United Nations on Wednesday. His modest proposal: removing Kenmore Square's famed Citgo sign, which is owned by Citgo Oil, a Venezuelan subsidiary. "Given the hatred of the United States displayed by dictator Hugo Chavez, it would be more fitting to see an American flag when you drive through Kenmore Square," said McDermott, who yesterday filed a resolution with the city clerk to have the sign removed. "I think people would soon forget the Citgo sign." 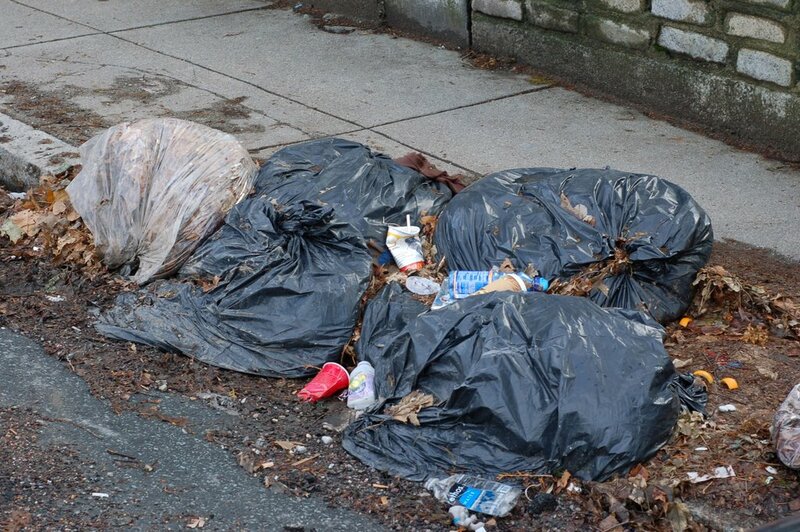 50 Cleanest (Dirtiest) Cities in America: "What's the cleanest big city in the U.S.? How about the dirtiest? In our July issue, we decided to find out, by analyzing data to score each of the 50 largest cities on air quality, water quality, industrial pollution (toxics), Superfund sites, and sanitation." Boston ranked relatively well in the air and toxics categories, but very low in water, hazardous waste, and sanitation. Primary brought highest turnout since 1990 - The Boston Globe: "South Boston has long been one of the city's highest-turnout neighborhoods, but in Tuesday's election, wards 6 and 7, which make up the neighborhood, ranked eighth and ninth out of 22 wards in the city with about 36 percent of registered voters casting ballots. There was higher turnout in Dorchester's Ward 17, with 39 percent, Roxbury's Ward 12, with 40.3 percent, and Jamaica Plain's Ward 19, where 45.3 percent of registered voters cast ballots. That was the highest percentage in the city. The lowest turnout was in Allston and Brighton, with about 23 percent"
I think we need to solve this problem if we want to solve many of the other problems we face in this neighborhood. Harvard endowment swells to nearly $30 billion: "Harvard University, already America's richest university, on Tuesday said its endowment swelled to nearly $30 billion as a new investment chief extended a long run of beating its benchmark." The Broad Prize for Urban Education: "The Broad Foundation announced on Sept. 19, 2006 that Boston Public Schools is the winner of the 2006 Broad Prize for Urban Education, the largest education prize in the country. Boston has been a finalist for The Broad Prize for the past four years, and this year's top honor brings the district's five-year winnings to $1 million." The Harvard Crimson :: Opinion :: Allston's Concrete Future "Last February, the University announced that it had taken the first step in assembling the new archipelago of buildings that will become the Allston campus, Harvard's gateway to the 21st century. The selection of German architects Berhnisch Architekten for the design of Allston's first biolab should be commended for recognizing that designing the future requires not only conceptual vision, but also vision on the scale of the built world. Harvard shouldn't plan our new Allston playground as an ossified artifact of architectural regurgitation. With the innovative Behnisch architects, our new campus will be a beautiful and modern one that jumpstarts our reputation as a leading center of the architectural world. " BostonHerald.com - Local & Regional: Soldiers Field Road closed at Brighton hotel for hazmat investigation: "BOSTON - Police are shutting down several roads around a Brighton hotel this afternoon as authorities investigate a possible hazardous materials situation. Officials say something in a truck at the parking lot of the Days Inn on Soldiers Field Road caused concern earlier today. A Boston police officer who first responded to the scene was taken to an area hospital with unknown injuries. A police spokesman says about half a mile of Soldiers Field Road near the hotel is closed, as are other roads around the scene." What should we make of this poll when "just like him" beats "best qualified" by almost 2 to 1? Haven't we learned from President Bush that we are not well served by voting for the guy who you most want to have as your next door neighbor? Instead how about voting for the person most likely to excel at the job even if he or she isn't the most popular kid in the class? With the ban gone, shows ponder shift to convention hall - The Boston Globe: "Beacon Hill lawmakers imposed the ban in the mid-1990s to protect the Bayside from state-subsidized competition, but this summer agreed to allow gate shows at the Boston Convention & Exhibition Center if they are too big to fit at the Bayside. BCEC gate shows must pay a $1-a-ticket tax to a new South Boston Community Development Foundation, a neighborhood charity." That's an interesting "community benefit" to tax events to benefit a community charity. If this is a precedent to follow here in Allston, think of all the things that Harvard is going to charge for (conferences, athletic events, parking, etc.) at their new Allston campus that could be taxed to benefit the community. The National Center for Public Policy and Higher Education has released its state-by-state report cards rating each state's postsecondary education. They gave Massachusetts A's in preparation, participation, completion, and benefits, and an F in affordability. The Massachusetts report card is here. A bull-centennial story in the Boston Globe? Not so bully for bovine motif - The Boston Globe: "They've settled details for the human flag, decided on pony rides at a riverfront fair, and come to a fragile agreement on a name. But now planners of a bicentennial celebration in Allston-Brighton next year have hit another obstacle, this time over the image of a bull some want to include in the official logo. ``It's something that you really don't want to think about," said Terri Weida, 62, a planning committee member and lifelong neighborhood resident. ``We have so much more to think about, as far as what would be representative of the community besides bull[manure]." ``The bull absolutely has to be a part of it," said Councilor Jerry McDermott, who represents Allston-Brighton. The Massachusetts Democratic and Republican Party primaries are September 19, less than one week away. Polls will be open from 7:00 a.m. to 8:00 p.m.
- The largest of the four buildings is proposed to be 8 stories high. 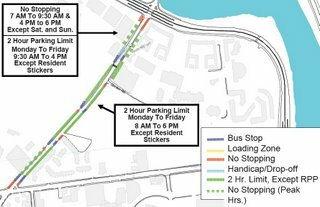 - All parking and loading would be underground, and the proposal is that the only entrance for cars and trucks to enter would be on an extended Rena street on the back side of the complex. - While predominantly laboratory space, these buildings also incldue amenities such as a child care facility, several auditoriums, a restaurant, a cafe, a rooftop bar, and a fitness center. It is not clear to what extent any of these amenities will be open to the public. Hey! Hey! I'm Walking Here! Interesting article about transportation attitudes and suggestions for New York, many of which would be applicable here in Boston. The Boston Transportation Department's website has some relevant information such as "Access Boston 2000 - 2010, Boston's Citywide Transportation Plan". The Allston and Brighton profile is here and has some factoids like 30,000 people each day use the Green Line, 11,000 use the route 66 bus, and the busiest roads are Storrow Drive, Soldiers Field Road, Cambridge Street, and North Beacon Street. 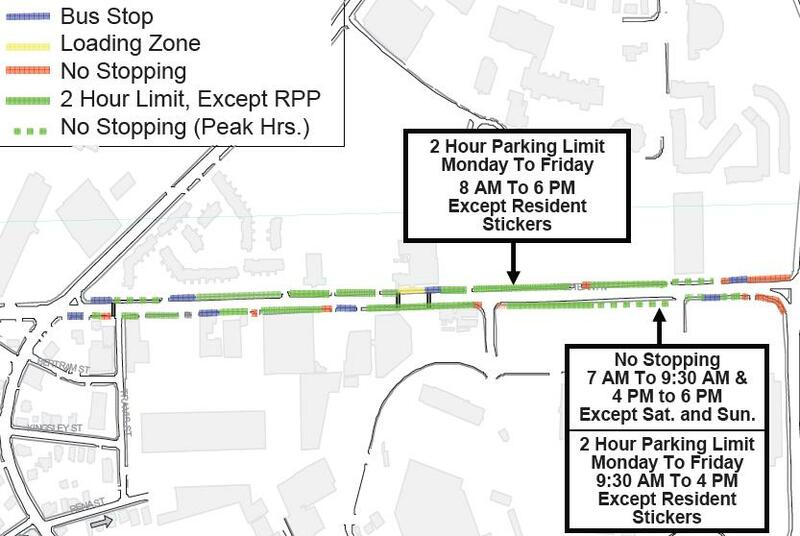 At last week's Harvard Allston Task Force, there was a request by the Task Force that the BTD prevent parking on North Harvard Street north of Western Ave on weekdays between 7-9 a.m. and 4-6 p.m. as a simple and feasible way to relieve some of the traffic crunch in the neighborhood. BTD will present a plan at the Sept 27 meeting (6:30 at the Honan Library). 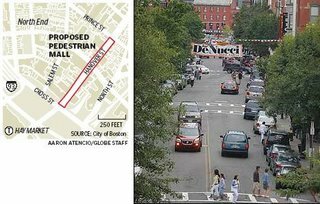 TownOnline.com - Local News: BC plans change: "Boston College has revealed a wishlist of projects they'd like to see fulfilled on their campus, which, if they become reality, would nix previous plans to build a large student center on Beacon Street in Newton. BC is scheduled to submit a new master plan to Boston between October and February; it is slated to outline their growth plans for the next 10 years. A presentation was made at tonight's Harvard Allston Task Force meeting about opportunities to create new open space in North Allston and improving the open space we currently have. The presentation can be downloaded here. This plan is still very much a work in progress, so please comment freely. The Cambridge City Council has asked that a committee be appointed to study ongoing Allston development and its effects, particularly on traffic, in Cambridge. Councilors are interested in monitoring Harvard University's plans for connecting the two sides of the river, and hope to learn more about how traffic flow, among other factors, will be affected. The council gave the mayor's office and city manager's office 90 days to appoint members to the committee. Drugstores Are Looking More Like a Growth Story - Will one grow in Union Square? "SHARES of big American drugstore chains have generally risen sharply this year, at least partly because skittish investors have been seeking cover in the sector, traditionally viewed as safe during turbulent times for stocks. Ms. Baker also said she thought that Walgreen’s stock could rise to $56 next year, or 27 times her 2007 earnings estimate of $2.05 a share. (Walgreen’s uses a different fiscal calendar, but Ms. Baker based her comparison of the two companies on the 2007 calendar year.) Shares of Walgreen now trade at $50.91, or 30 times earnings over the last 12 months. The longer-term case for investing in the drugstore stocks depends largely on the notion that aging Americans will gradually be consuming more pharmaceutical products. So if there is going to be a new chain drugstore in Union Square (at the Jim Did It sign building) it would be great to see it have a design as good as possible (instead of as cheap as possible). The current proposal with a large parking lot at the corner of Hano and Cambridge Streets is one clear area for improvement. Participants can register online or on race day at The Kells on Brighton Avenue in Allston starting at 9:30 a.m. Sunday; the run/walk will start at noon. For more information , go to www.brianhonan.org." Tagging gets real: An artist's new medium - The Boston Globe: "Lombardi is making a name for himself painting enamel elephants, giraffes, rhinos, monkeys, lizards and walruses on ``Stop,' ``Yield,' and ``No Parking' signs. These are signs in his studio, that is -- not on the street. He has tried the graffiti route, and it cost him a weekend in jail, and some community service. Lombardi and Project SF will be showcasing their skills on Saturday at Underground Snowboard and Skate at 860 Commonwealth Avenue. Its nice to read about artistic skills being put to a postive use! Already the city has spent $40 million to acquire one of the parcels of land he identified: a stunning 137-acre quarry that will be, when additional land is added, the city’s largest park. 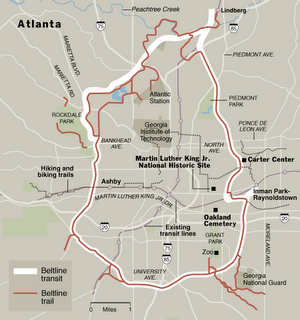 The $2.8 billion Beltline began life humbly, as a thesis project for Ryan Gravel, a graduate student in architecture and urban planning at the Georgia Institute of Technology. That was seven years ago. “It’s very important that cities and communities go for a big vision,” Peter Calthorpe, an urban planner based in San Francisco, said in a telephone interview. “Cities need these bold moves and elements to make them exciting places to live." It is inspiring to learn about this wonderful project similar to what many people in Allston and Brighton are thinking about. What will be our big vision and bold move? The Hoot - The magical mystery music tour: "Allston: Widely known as the 'student ghetto,' this beautiful piece of land is the area in between Boston University and Boston College; in this space, students from all universities in the area, new apartment holders, and poor musicians take up residence to create a vibrant, if not completely sanitary, community. Concert posters, graffiti, and homeless people line the streets as shouts for change and announcements for the newest musical acts blend into the background"
BC envisions a reshaping of its campus - The Boston Globe: "Boston College is planning a sweeping overhaul of its campus that would add at least four new buildings, relocate an MBTA station, and bring student facilities closer to the school's neighbors in Newton and Brighton. In addition, the school is eyeing construction of a dramatic walkway over Commonwealth Avenue near Lake Street that officials hope would knit together the Chestnut Hill campus with the 44-acre property in Brighton that the college acquired two years ago from the Catholic Archdiocese of Boston." As a result of Student Turnover Campaign, inspectors conducted roughly 200 inspections resulting in the issuance of 65 violations; 115 pieces of discarded furniture tagged and removed from sidewalks; 72 trash and parking violations; and 75 tickets for improper storage/placement of trash. Bok hopes to continue the momentum regarding Harvard's plans for Allston. Specifically, he explained, he intends to review the plans for the campus's first new buildings, to submit a master plan to the City of Boston, and to establish design guidelines for Harvard's construction projects in Allston. Police arrested seven teenagers at a Brighton house party early yesterday after a 20-year-old man said he had been beaten and stomped by attendees. The victim was taken to St. Elizabeth's Medical Center after police found him behind an address on Greylock Street. Boston College has booted scores of tenants from a prime apartment complex in Cleveland Circle to make way for graduate students - a move that runs counter to Mayor Thomas M. Menino's push to get college kids out of neighborhoods and into campus dorms to relieve the housing crunch on city residents. BostonHerald.com - Local & Regional: Wages slump in Bay State, Dems lambaste Mitt: "Median hourly wages dropped more in Massachusetts in two years than in any other state. The median hourly wage in Massachusetts, adjusted for inflation, dropped nearly 5 percent between 2003 and 2005 - $17.19 per hour to $16.35 per hour - the steepest drop in the nation during that time." City is testing speed limits to protect children at 3 parks - The Boston Globe: "The speed limit for streets surrounding three city parks has dropped to 20 miles per hour, as city officials test whether doing so will make it safer for pedestrians, particularly the younger patrons of the playgrounds. The pilot program was set up around Almont Park in Mattapan, Hobart Park in Brighton, and West Street Playground in Hyde Park in response to studies of speeding in the area conducted by the city's Transportation Department. The studies found that many motorists pass by at high rates of speed, posing a concern heightened by the youthful nature of the park's primary patrons. Mayor Thomas M. Menino's administration has been lobbying for legislation to lower the speed limits throughout the city, which on most streets is 30 miles per hour, to 25 miles per hour, said Acting Boston Transportation Commissioner Thomas J. Tinlin , but it's been difficult to gain the needed support. - Who is not providing the "needed support"? Even if the speed limit gets lowered, it won't mean much without enforcement. On dangerous streets like Lincoln Street there are often drivers going far faster than the speed limit but no enforcement of the existing limits. Cheers to the Globe for making this information available and their use of technology to present it clearly and dynamically! Enter your zip code and you can see who is donating what to the candidates for governor. In Allston and Brighton, Tom Reilly has raised the most money by far. Brighton has contributed much more than Allston. It would be interesting to normalize this based on # of residents, per capita income, etc. 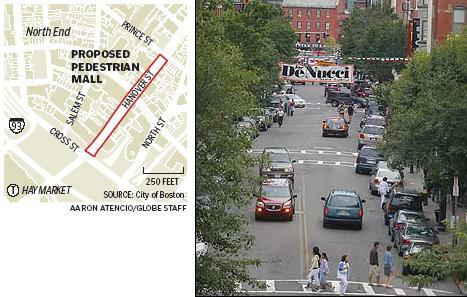 The City is supporting a plan to close Hanover Street to traffic and create a pedestrian mall. Trails to start on weekends next spring. 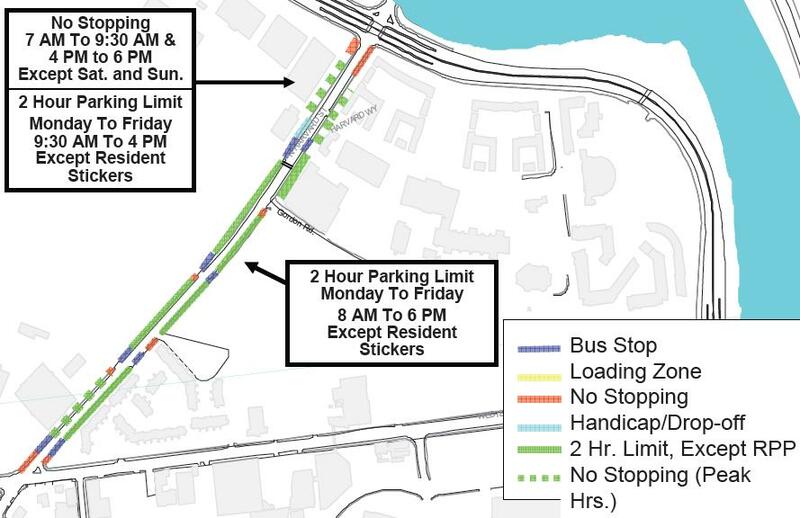 Cambridge already closes Memorial Drive on Sundays in the summer. Is there a place for something similar in Allston's future? TownOnline.com - Local News: More money for Brighton Park makeover: "Brighton Center is a little bit closer to having its own piece of open space thanks to the hard work of some dedicated volunteers and some grant money. Recently, Brighton Park, which is at the intersection of Chestnut Hill Avenue and Academy Hill Road, received a grant from the Edward Ingersoll Browne Trust Fund for $50,000. " Students - Welcome back to Allston and Brighton! “It’s not Ashford, it’s Trashford,” said Thomas Demmel, 21, a foreign student from Germany who has lived in an Ashford Street apartment for the past year. Demmel, a junior at Boston University, will now be shacking up in a swankier North End apartment, despite its distance from campus. The Dumpster behind 15A Linden St. was overflowing with trash, so much that Mayor Thomas M. Menino and the inspectors had to walk gingerly through the back lot, where two refrigerators and a mattress were dumped. And then they saw the rat - first one, and then another, both dead. Yesterday, the mayor kicked off his annual Student Turnover Campaign, leading a small army of city workers as they fanned out across Allston and Brighton. In addition to keeping buildings clean and sanitary, landlords must keep front doors locked and install carbon monoxide and smoke detectors in every unit and hallway, Timberlake said. Tenants whose buildings don’t meet those standards should request an inspection by calling (617) 635-4500. On Thursday, Menino joined an army of inspectors checking out apartments. They didn't have to look hard for violations. "We're concerned about the understructure of the porch. It is buckling on the second floor," Menino said of one Allston apartment. At one Allston apartment rented by five students for $2,800 a month, violations were being corrected before the city enforcers showed up. But two blocks away, violations, like the trash, were overflowing. Dead rats were also found at the apartment.